All EYMS buses now have brand new state-of-the-art ticket machines. If you use a concessionary pass to travel on our buses you will notice some changes when you board a bus with a new machine. 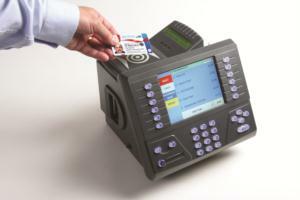 The new machines can read the chip in your pass, so boarding the bus will be quicker and easier, but you will have to present your pass to the driver in a different way. Please have your pass ready, out of your wallet/bag and in your hand as the bus arrives. When you get on the bus place your pass on the 'target' on the ticket machine, with the photo facing upwards so that the driver can see it. There's no need to tell the driver where you are travelling to. After a few seconds the machine will beep, a green light will come on and the driver will invite you to take a seat. There's no need to take a ticket, but please remember to pick up your pass from the machine before moving down the bus. Take a seat and enjoy your journey! What if an Inspector gets on the bus? Our Inspectors will have hand-held card readers, just present your card to them when they ask for your ticket. What if my pass doesn't work? On rare occasions the chip in a card can be faulty and the ticket machine will not be able to read it. If this happens the driver will give you advice on what to do. Even if your card is faulty you will still be allowed to travel. Help, I'm still not sure what to do! Don't worry, your driver is there to help - if you are not sure what to do, just ask. If it's your first time using the new machines, tell the driver and he or she will show you what to do. After using the ticket machines a few times you will find that you get used to using the new system, and it is quicker and easier to board the bus. This means the bus will be able to spend less time at each stop, and so will be able to keep to time better.